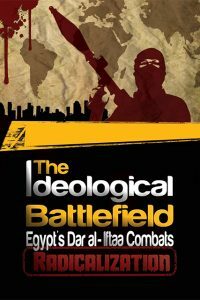 In a new move to counteract the extremist ideology adopted by terrorist groups and in an attempt to clarify the true teachings of Islam to the West, Dar al- Iftaa published a new book in English titled “The Ideological Battlefield: Egypt’s Dar al- Iftaa combats radicalization“. This book aims at deconstructing the erroneous thinking methodology of QSIS terrorist group among other affiliated groups. The book also contains a true definition of the concept of the “Islamic Caliphate” and the meaning of applying the Shari’ah in our modern world. The book paid special attention to clarifying the proper exegesis of the Quranic verses along with the Prophetic traditions which tackle the issue of jihad and engaging into wars.